All those times I paid $17 for a tin of Escudo are worth it when I randomly come across something produced by McClelland, or a couple spare pounds of Esoterica, etc. I would not call this particular store super well-stocked (they don't even carry C&D or GL Pease, and mostly deal in re-branded Lane aromatics), but even still, it's good for pipe smokers with the luxury of a physical store to do their part to keep 'em in business. Occasionally you'll even find a bargain. If your local B&M has any selection of pipe tobacco coupled with staff who know what they are talking about, by all means you should shop there. Some of us aren't that lucky unfortunately. What we're not lucky here with is the blends selection... and prices. We have a great brick and mortar near here. I buy something every week there. I support my local B&M when I can. Their not much on pipe related stuff, but their trying. I tend to make recommendations when I feel their interested. The store is run by women, but that's not said in a bad way. Their trying to learn, so I'll give them credit. One of the women even asked me for my Pipes & Cigars magazines when I'm finished looking thru them. I wrestle with this. I want to support my local B&M, I even pay more for the same things just so that I do occasionally. But generally the difference is considerable and the selection is underwhelming. Mac Baren Navy Flake for instance is $32 + tax vs $18 + $4 shipping, or Solani 633 is $23 vs $13. I'm having a hard time staying the course. Occasionally I buy some bulk, but it's still far more $/oz. Plus I already have a vastly more extensive selection at home. Not to mention pipes are $50 to $75 more than I can buy online each. I'll keep stopping in and buying a little bulk and cleaners - but like I said, I wrestle with it even though I like the owners a lot and am motivated to support them. But generally the difference is considerable and the selection is underwhelming. I agree 100%, alexnc. I probably buy 70% or more of my tobacco and all my pipes online, but I do try to continue buying from my B&M, even if it's just little things like pipe cleaners, or Lane 1-Q (which I smoke very little of), and I try to buy a tin every couple of weeks or so. It's definitely more cash outlay, but to me it's worth it. And when they get their annual shipments of things like Esoterica and I have a few weeks to decide whether I need another pound of Penzance or not, it's well worth it (not to mention they'll call me and ask if I want them to put some aside for me). But I'm also not immune to the differences in price. I've never bought a pipe there, and you better believe I'm not shelling out $1000+ for a Dunhill Cumberland. I like those guys, but I don't like 'em that much. I wish this great forum had a "Like" button. The only worthwhile tobacconist is 1.5 hours from where I live. The little smoke shop here in town carries bulk 1Q, BCA and 3 other Lane aromatics for $5/ounce. I wish I had a B&M option but it is all online. I know this probably sounds strange coming from a guy who makes a living selling pipes and tobaccos online, but I absolutely am a huge fan of the B&M Tobacconists. There is nothing, IMO, that can compare with walking into a "real" pipe shop and visiting with caring and knowledgeable employees who strive to make your stop a memorable one. And being able to - in some shops - sit down and enjoy a bowl with perhaps a fellow pipe smoker or two, is very relaxing and just flat fun. While I try to make my online shop as personable as possible, there is no way I can compete with the atmosphere of a real pipe shop. I absolutely support and salute the B&M's that are still with us. Whenever I visit a city that has a pipe shop and I have the time, I will go there before even trying to find a good place to eat! How timely! I was at my B&M today and BAM! 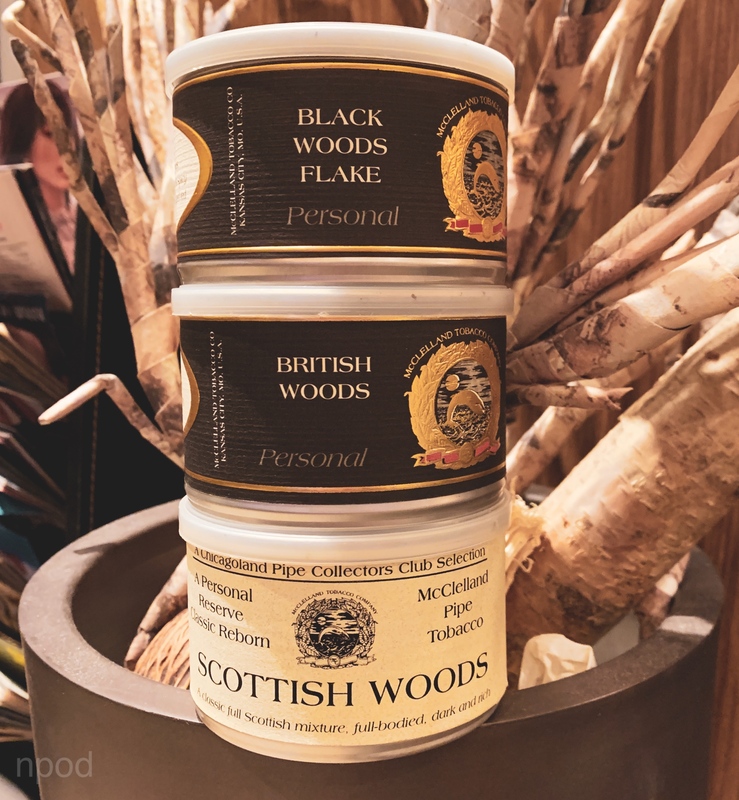 I looked in the drawer when he wasn't looking and there were two tins of McClellands Black Woods and British Woods just sitting there. I already had a tin of Scottish Woods with me to open for the group. But wow, two awesome extinct blends just sitting in the bottom of the drawer. He sold them to me at cost. I opened them up and we all had a blast. Looks like we both had a good day for McClelland hunting, Neal! Congrats on the score. Those who have a B&M I consider you fortunate. Nothing around me in a 2 hour radius. Hence online shopping only for me. I wish I had a B&M to support. Nearest to me is 2 hours. I buy from then when I can. For the higher price at a brick-and-mortar shop you get support and information, and in-person looks at a good selection of pipes. When they're gone, you "got" nothing. I used to work at one of the best local cigar and pipe shops in my area. I revisit from time to time and smoke a cigar and grab a tin or two, occasionally a pipe. The cost difference is a hindrance. I'm lucky to live in southern california where there are plenty of cigar shops, but ones that carry good pipe commodities is a little harder. Money is one issue by sitting in traffic to pay more money is the main deterrent. It is really nice to see the pipes before you buy. Tinderbox is awesome if you've never been to one.i focused on the aged tins to feel I get my monies worth. I've been lucky too in finding McClelland, butera, and expensive esoterica. We used to have a small B&M here in town that I liked to visit every now and then for my various sundries. They carried a wide assortment of bulk tobacco as well as 15 - 20 different tinned blends that they regularly carried. They also made it a habit of ordering a couple of tins of new blends whenever they placed their order. Unfortunately the owners decided to retire and sold the shop about three years ago. The guy who bought it runs a head shop - glass pipes, hookahs, and all sorts of "herbal" smoking supplies. Sadly, it turned into just the sort of disaster you'd expect. As he sold out of the good inventory, he replaced it with cheap Chinese knockoffs. He carries a handful of bulk tobaccos and a few tins. At first he kept the tobacco side of the store separate from all the glass, but the last time I was in there he had it all mixed up. After several visits where I left empty handed, I've sadly given up. Haven't been back for several months now. It is really nice to see the pipes before you buy. Sounds kind of obvious doesn't it? But I don't think I've ever handled a pipe before I bought it. But there just isn't anything like what some of you guys have in the US up here. As cheap ...I mean thrifty as I am, I've bought pipes at my local independent shop over the years at fairly good prices. Perhaps I could have bought them for a little less online even with shipping, but I got to preview these in person, and in some cases go home and think about them before making the purchase. I don't remember any clunkers, whereas I've had a few of those with online purchases. Tobacco is a little more in tins, but in bulk, once you calculate the shipping, blends are only slightly more. The proprietor is straight up about his sourcing, and contributes grounded information on pipes and tobaccos. it's worth the "membership" (higher prices) to shop there. As someone who recently moved and got back into pipe smoking after a hiatus, I can 100% agree! I miss the people of my old B&M. There was always great conversation, they were super knowledgeable, and just had a great small town feel which I appreciate. Mike, ain't these guys close by to you? I did, they sold me a dozen pipe cleaners for $10. Canadian tobacco shops are hopeless. Gasp! That's armed robbery. I get a full pack of 75 Brigham cleaners for half that at my local B&M. You are a good person to do business with. You should have a B&M during your spare time. We have a decent selection at our local b&m. All of the dunhills and Peterson blends are still on the shelf. They recently brought in some of the Comoy blends and will be brining in more, and also have a few Rattrays, Macbaren and Davidoff tins. They also offer a lot of the lane aromatics in bulk but also have some Gh&co and stokkebye, although it is out of stock, the most recent addition to the bulk is the sutliff Virginia slices. The pipe selection is slow moving. There are good pipes but nothing new very often. The estate cabinet is always changing and features some nice Peterson, savinelli and Stanwell pipes at all times. The prices cannot be beat and the restoration work is done very well. The cigar selection is decent as well. Lots of the big name brands and all are kept properly in the humidors. The prices are brutal but are in line with the Canadian market. I wish that the staff were more knowledgeable however. The owner is great and is happy to engage in pipe talk.